Separable Sockets - Philadelphia Instruments and Controls, Inc. - Specializes in the production of temperature related products. For 7"-9"-12" Scale Industrial Thermometers Available in Brass, Steel, Monel and Stainless Steel. 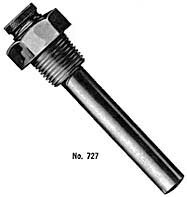 Separable sockets are machined and taper reamed to accurately fit the tapered stem or bulb chamber of the thermometer. for etched stem laboratory thermometers. Machined from solid bar stock. Equipped with threaded plug and chain, to keep dirt from entering test well when not in use. Available in brass or steel, ½" and ¾" N.P.T. 3/8" Bore. Extension neck test wells also available.